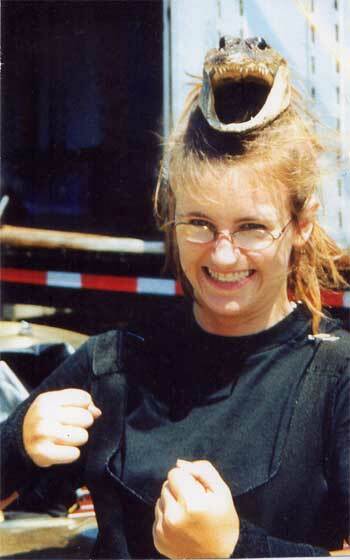 Ryann Slauson, a Teal Sound pit member in 2002 and 2003, submitted this one. "This is a picture of me from 2002 with Teal Sound at the Coast Guard Open in Grand Haven, Mich. "Crocdonk" is our pit mascot and sits on my xylophone for every show. I'm marching again this year and he's still traveling with us!" Thanks Ryann! E-mail your Forzato submissions -- and we will get to them all, in time -- to dave@dci.org along with where and when the photo was taken. Send some biographical information about yourself as well. We'll give you full credit. Also, let us know if you want your e-mail address included, to get feedback from other drum corps fans.